When your eczema is reacting to everything under the sun and you don't know where to turn, Diprobase ointment is a very safe bet and something I will definitely go back to if my skin ever gets really bad again. So using nothing on my skin seemed like a massive improvement on any kind of eczema cream for the time being. But my skin felt so rough and sore (particularly on my face) I felt compelled to put something on it to make it feel more comfortable. A friend of a friend recommended DiproBase ointment to me a while ago and I bought some but hadn't used it that much. Because it's an ointment emollient rather than a cream I thought it might be ok so the first time I used it I just put the tiniest amount on the roughest dry skin patches on my face. It didn't sting at all and did definitely ease the discomfort. This stuff is pretty greasy, not dissimilar in feel from Vaseline petroleum jelly to be honest but must be better for your skin. After a successful tentative trial I decided my skin liked the DiproBase ointment so the next couple of days I put plenty of it on morning and night. Shiny face ahoy! But hey, that was the least of my worries. Then basically my skin improved massively! It had already calmed down quite a bit from the initial flare up but the ointment seemed to soften all the rough patches, and caused all the really dry bits just to flake off. This sounds gross but basically it left me with nice smooth skin underneath. I was sooo happy! Most of the worst parts just sort of rubbed away in the shower. I suppose when your skin is bad, if you can't restore it you just shed it and start again. This was such a massive relief. It coincided with a very important day at work for me when I had to do a big presentation. I wanted to wear make-up that day. I didn't because my skin was still a little dry and flaky in patches, which foundation would only have highlighed. Because my skin had actually returned to normal skin colour instead of those horrendous red patches, I just settled for a tiny bit of mascara and really didn't mind too much. 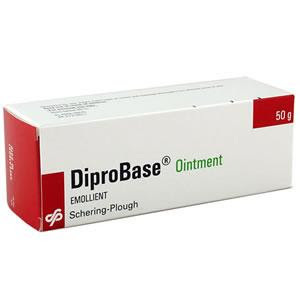 DiproBase ointment is really good value at around £2 for a 50g tube. When all creams seem to sting or inflame your sensitive skin, I would defintiely recommend giving DiproBase ointment a try. Yes it's greasy, but if you're as desperate as I was you won't care. Discovery - Diprobase ointment also makes great lip balm! I usually use vaseline and have bought this today hoping it would moisturize as well as act as a barrier. Thanks for your review.